This project is ideally suited for a woodworker who likes to sit outside during the summer, soaking up the sun with a good cold drink....well, think that counts most of us in. The project is made very cheaply, I managed to squeese mine from a softwood 2x4, and a few scraps of mahogany. End result is a good looking, solidly built table! This project was inspired by Charley Fell from UKW. Big thankyou to him as he came up with the original design with this great little table. 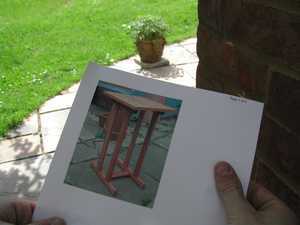 So here is the original table, made by my mate Charley Fell. He made his a while ago, the table was built from mahogany and was designed to sit beside a garden bench or deck chair to place drinks, a radio or whatever takes your fancy! I really like this design, it looks great on the patio, although with all of these mortise and tenon joints to cut, i'd better get busy! So I started off by working out the best height for my table, bearing in mind where it was going to sit. 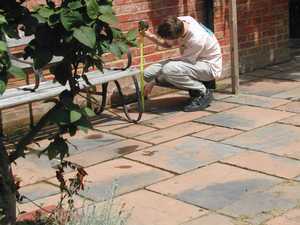 I suggest you get a tape measure and work this out before you put metal to wood. 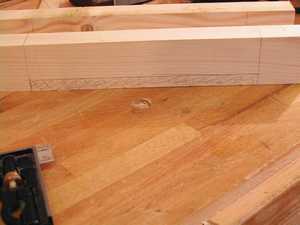 Exact measurements are not always important when your building a piece of furniture, i'd much rather make my own piece than copy somebodys plan exactly. However if you look at the plans section, a PDF plan might soon become available for this project. 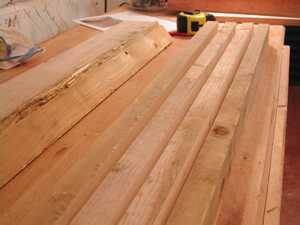 As you can see, I plan to get much of this project from this single 1.8m 2x4. This may look like pretty rough wood, but it will be sawn and planed into perfectly workable timber. A load of this was given to me shortly after a neighbour had finished having an extension built. Being me, I couldnt reject it, just incase it would be useful some day! I am cutting this timber in half exactly. This will make it much more easy to handle when i'm inside the workshop. The bulk of this project is made from fairly thin wood, about 35mm thick, by 50mm wide. 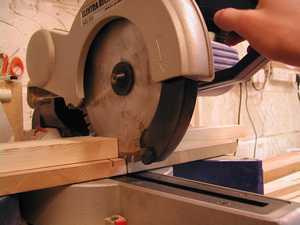 I am on the tablesaw, ripping the wood to thickness. I will be able to draw 3 parts from each half of my 2x4. And as if by magic, here are the 4 parts which will form my leg assemblys, all the vertical and horizontal pieces. It is still in a rough state, and I will fix this by taking it over to the planer. 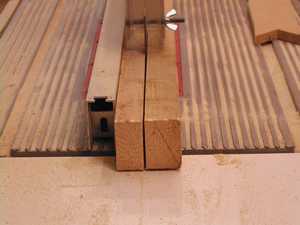 This will help true the wood to 90 degrees, and also smooth and clean the surface. 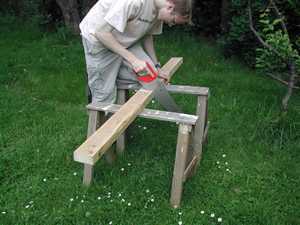 After planing the wood, I can cut my parts to length, here I am cutting the 4 stretchers. 2 will rest on the floor (the feet), and 2 will support the top. They will be seperated with 4 vertical legs aswell. Sounds confusing, but it will become clear later. This is one of the feet. I have shaded an area of the wood I am going to remove. This will allow water to pass under the timber. 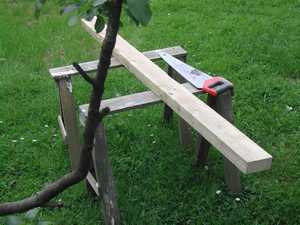 Ideally I would use a hardwood to make this table from, however that is not currently possible. On the top of the feet, I am marking out for 2 mortises. The feet will be pretty much mirrored by the 2 top supports, by the fact that they will have identical mortises to accept the 2 legs. 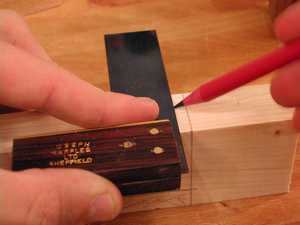 I am using a marking gauge here to complete the mortise marking out. 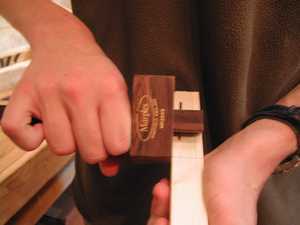 The marking gauge is a fantastic traditionaltool, it can be easily adjusted to suit the mark you are making. They have been around for years, and still have an important use in the modern workshop. I would advise you buy a decent quality one, Marples is probably a good make to buy.